Organic farmer Phil Foster has developed a creative way to nurture the soil on his 200-acre farm near Hollister. He plants cover crops in a single line at the top of the planting bed, saving water and seed while keeping the furrows clear for irrigation. "We were finding we couldn't use cover crops because of water," Foster said. 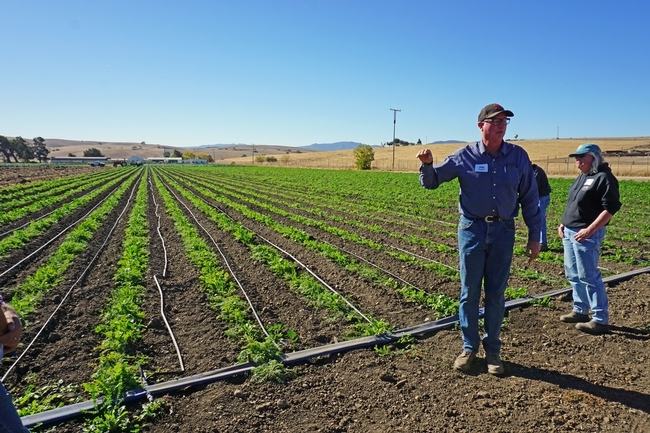 The narrow strip makes the best use of the limited water supply, while garnering the benefits of cover crops - which buffer soil temperatures, inhibit weeds, increase soil microbial activity, improve water infiltration and add nutrients. 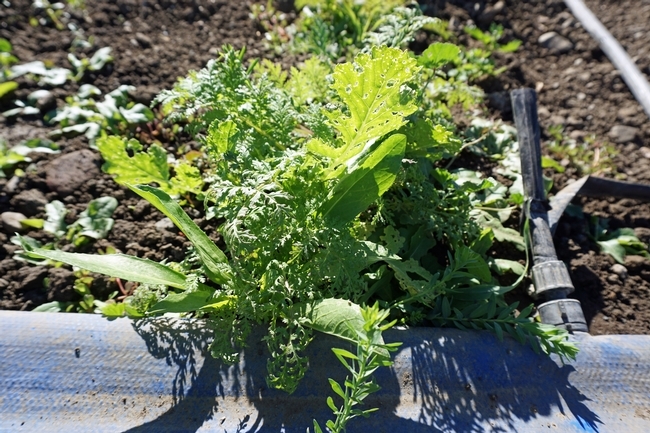 Growing cover crops prepares the soil for the production of high-quality vegetables. Organic farmer Phil Foster stands in front of a field with cover crops planted in strips at the top of the planting bed. Foster is one of eight organic vegetable growers who are working with researchers at Chico State, Fresno State and UC Agriculture and Natural Resources on a project funded with a USDA grant designed to make significant improvements in soil care in organic production systems. He guided project participants around his farm, equipment yard and compost operation in early November to share the techniques he and his staff have developed over three decades to promote soil health. Tiny pores and roots can be seen in the soil at the Foster farm. UC Cooperative Extension farm advisor Sarah Light examines a soil sample. 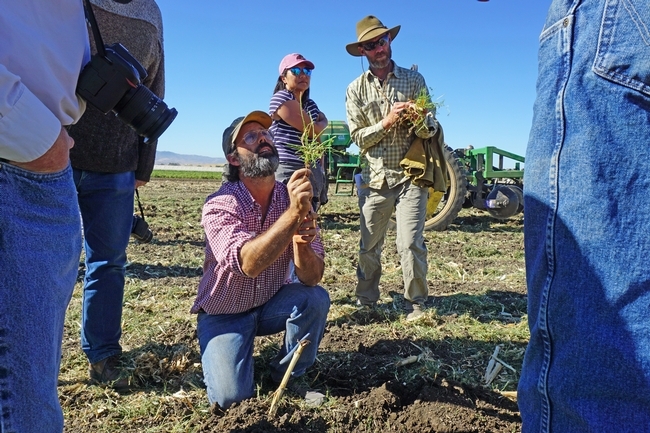 The agronomy expert, who serves Yuba, Sutter and Colusa counties, is a cooperator on the project. 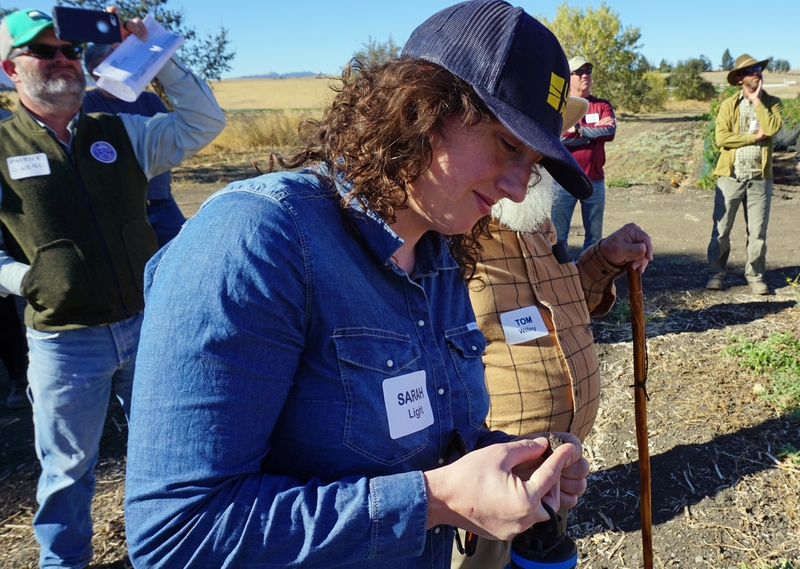 Tour participants marveled at the soil characteristics, admiring tiny pores and roots in clods of dirt, evidence of the soil's capacity to move water and nutrients. They studied the plant and soil conditions after farm manager Efrain Contreras pulled a carefully crafted implement for rolling down the cover crop across the field with a tractor. Foster credited Contreras, a 30-year employee, for his role in building the soil on the farm. Labor, Foster said, is his biggest cost. He has 50 full time staff, many with 5 to 20 years of experience. "They are the key to to the success of the ranch," Foster said. Farm manager Efrain Contreras pulled an implement through a mature cover crop to show how the field can be prepared for planting. Minimizing and, eventually eliminating, soil disturbance can be combined with organic groundcover, year-round root growth and robust biological activity in the soil to further promote soil health. Following the tour, the farmers talked about ways to attain the goal on their farms of no-till organic vegetable production. Foster said he will experiment with reducing soil disturbance to determine whether doing so will maintain or increase yields. 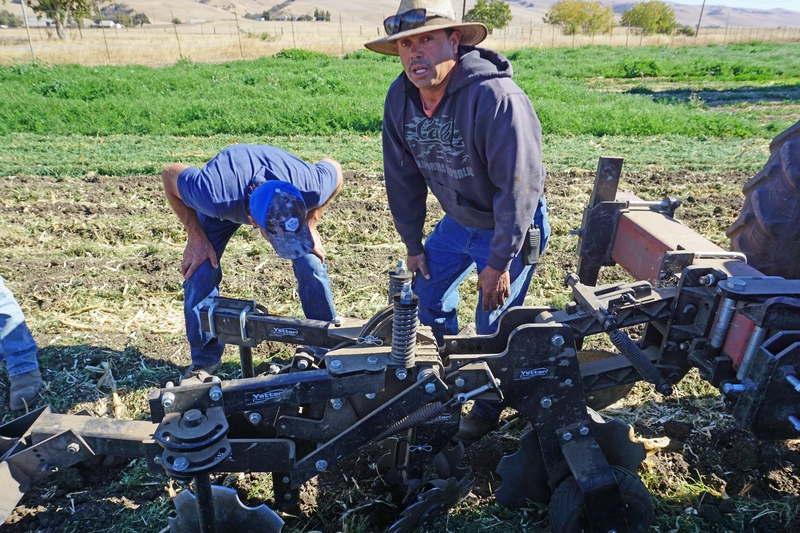 Another farmer in the project, Scott Park of Meridian, Calif., 50 miles north of Sacramento, said he will dedicate eight acres of his organic farm to comparing the results when the cover crop is chopped and left on the soil surface to chopped and incorporated with tillage. 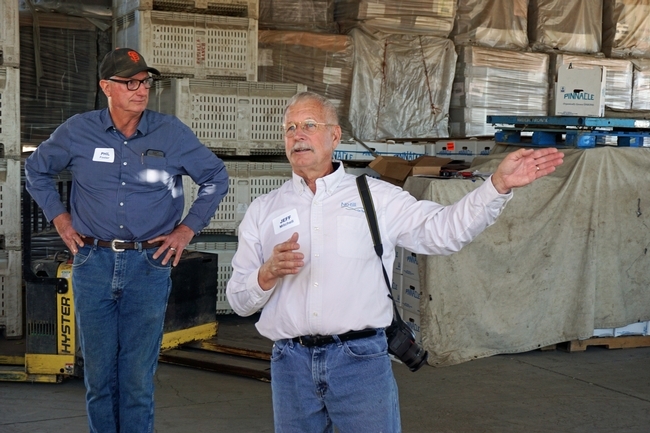 Paul Muller and Andrew Braitt of Fully Belly Farm in the Capay Valley suggested the researchers could help the farmers by identifying optimal, effective cover crop rolling techniques. Retired organic farmer Tom Willey of Madera suggested grant funds be used to purchase appropriate scale cover crop seeders for on-farm experimentation. "We're making great progress," said project coordinator Jeff Mitchell, UC Cooperative Extension vegetable crops specialist. 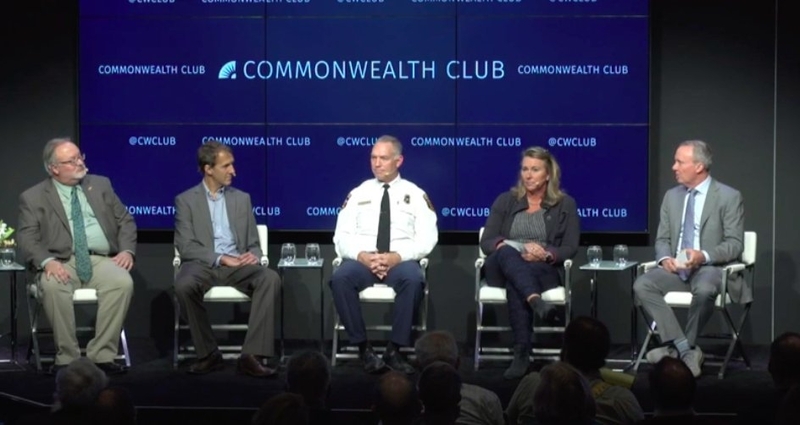 "By getting together regularly, we're seeing opportunities for moving further toward reduced-disturbance on the farms, identifying the equipment needs and establishing effective channels of communication." 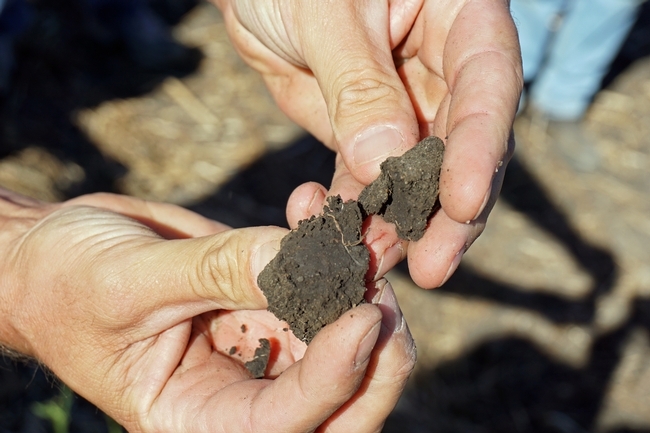 Over the project's three-year term, the farmers and researchers will continue to experiment with soil-building techniques and share results. Andrew Brait of Full Belly Farmers, foreground, looks at roots and nodulation of rhizobia on the cover crop. Kelly Mulville and Esther Park of Paicines Ranch are in the background. A safflower and vetch cover crop growing in the autumn light. Workers, in the background, manually weed the safflower and vetch cover crop. Project coordinator Jeff Mitchell, UC Cooperative Extension vegetable crops specialist, and Phil Foster. 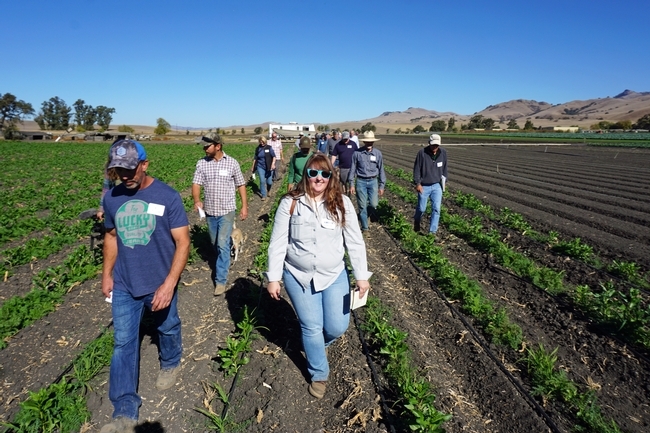 UCCE farm advisor Amber Vinches, center with sun glasses, is a cooperator on the project. 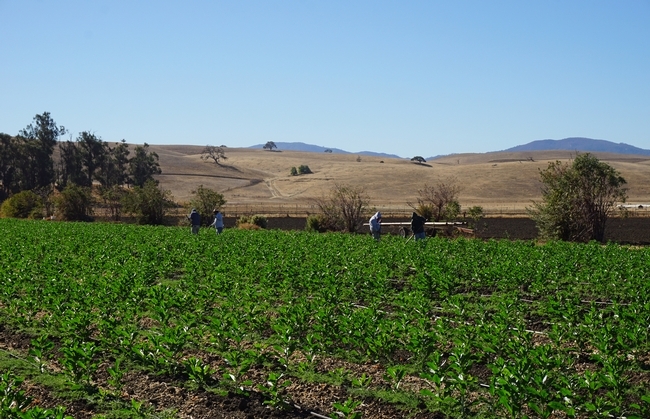 Vinchesi serves vegetable crop farmers in Colusa, Sutter and Yuba counties.